Fabian Schär's fifth minute header was the difference as Switzerland began their Euro 2016 campaign with a marginal victory over an Albania side who were reduced to 10-men. Lorik Cana received his marching orders when he was given a second yellow for a handball, but that wouldn't deter the Kuq e Zinjtë from pushing forward to try and get something from the game. While Switzerland's chances were in abundance, they were thankful for keeper Yann Sommer, who denied a late one-on-one chance for Shkelzen Gashi. With a sea of red and black shirts quickly deploying to the defensive duties, Switzerland were prompted to attack early on and needed no second invitation. After controlling the first minutes of possession, Ricardo Rodriguez surged down the left and won a corner, of which would give his nation the lead within 5 minutes. Xherdan Shaqiri's delivery brought all sorts of trouble for Albania, as Fabian Schär capitalised from the chaos to put the Swiss in front. Mërgim Mavraj, who was assigned with marking the central defender, lost his footing as goalkeeper Berisha surged off his line to try and knock it away. He missed the ball only slightly, with Schär managing to direct it into the net. Up until that point, Albania seemed rather flustered, almost still in the international friendly setting, but that came to an abrupt end when they conceded. 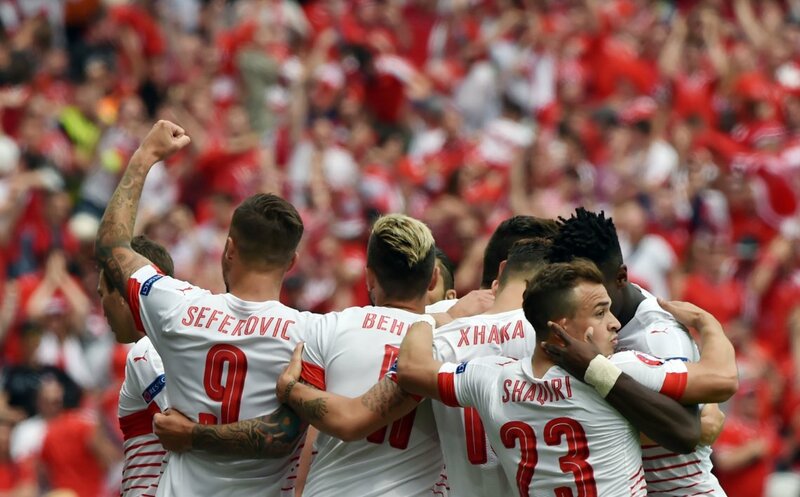 After an ambitious preset free kick attempt was stuffed, they pressed high to try and disrupt the tempo, Switzerland's crisp passing needed to be broken up someway or another. Meanwhile, family relations were put aside too. 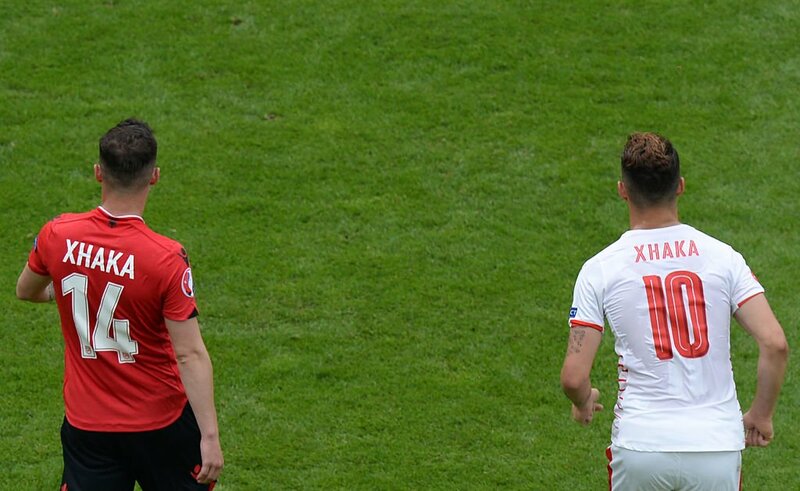 Granit and Taulant Xhaka were on opposing sides but remained unafraid to test each other, with intense tackling as they looked to favour the game for their respective nations. Albania were, at times, weak on the counter attack. It seemed all too easy for their opponents to send it straight up and through the defence to give Haris Seferović a pop at goal - but the shot didn't pack enough to threaten the keeper. The tension between the two nations had been well documented on the run up to kick off, and the challenges were reflected on the pitch. Back in 1990, the breakup of Yugoslavia saw tens of thousands of Albanians flee the Balkan War and migrate to Switzerland. The Swiss football federation have been criticised in the past of taking advantage of this in the youth system, recruiting them in programmes resulting in players such as Shaqiri, Rodriguez and Embolo sporting the Swiss colours. 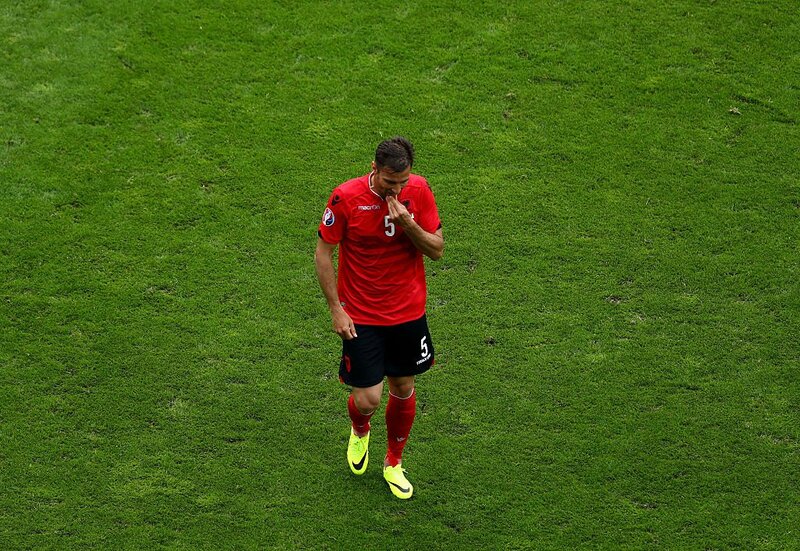 Lorik Cana was booked for a challenge from behind on Dzemaili as both teams left their mark on one another. The game was yet to spill over, although it was close to - Albania needed to pull out all the stops to restrict the flow of play. Yan Sommer's incredible save preserved Switzerland's lead at the half-hour mark. He denied Sadiku in spectacular fashion after Hysaj started the move with a superb ball down the right. The keeper was back into action a few moments later with a simplistic save as Roshi crossed low. Just as Albania began to rev up and look for that equaliser, they were dealt a bitter blow. As they continued to rush forward, their enthusiasm increased, but the loss of their captain would make an already huge task a starker uphill climb. Lorik Cana received a second booking for a clear handball to stop Seferović getting through on goal, and could have no complaints as Albania were reduced to 10 men. A threat of a huge free kick opportunity also loomed large. Dzemaili rattled the far post with a low curling effort that was out of reach for the keeper that really could have spelt the end of the game. The Genoa midfielder dragged another shot wide a few moments later. By the stoppages of the half, Switzerland were running the game. Seferovic forced another save as they comfortably went into the interval with a one-goal advantage. Albania had a few bright spells but Switzerland remained in control for the most part, and the red card to the Albanian captain really put things in their favour. Switzerland were already setting the pace early to start the second half with surges from Rodriguez and Mehmedi keeping the Albania workload rather large. Berisha then was forced to deny Seferovic, with a long drive from a tight angle adding to the growing number of Swiss chances. Albania weren't being as outrun in the second half though. Yann Sommer sprung into action to thwart their early chance and it was well matched. But once again, Berisha and Seferovic came face to face, and yet again, Berisha was the man who prevailed by stopping the striker's attempt. Still, their spirit could not be broken. They did all they could to try and steal a point, and perhaps deserved to at times. The biggest chance came with 3 minutes from the whistle. Gashi was all alone and through on goal, with just Sommer to beat, but with the keeper approaching, he tried to put it away but a superb stop by the Swiss keeper would lead his nation to victory.